If I was to tell you that I took the family off for a wet weekend in the shadow of a cement factory you'd probably think I was mad, but that is exactly what we did and we had a great time. 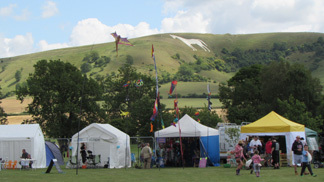 The White Horse Country Park at Westbury in Wiltshire is the current home for the Village Pump Folk Festival, which laid down its roots almost 50 years ago at the Lamb Inn in nearby Trowbridge. The park is bounded on one side by the Great Western main line between London and Plymouth and the aforementioned cement works, and the escarpment up to Salisbury Plain on the other. Overlooking the area is the White Horse carved into the side of Bratton Down that gives the park its name. Hopefully, this review will give you an insight as to what The Village Pump Folk Festival was like to attend and what my partner Siân and our children Gethin and Morgana thought of it. With 3 days and four stages we were never going to get to see everyone so it was a case of consulting the programme & deciding who we wanted to see. Over the course of the weekend we managed to catch at least one act on three of the main stages, the only one we missed out on was the Club tent. First up was Sam Carter and Jim Moray's new project, False Lights, on the Cillage Pump Stage. Carter and Moray have gathered round them a talented Bunch of musicians and have produced a fine folk rock band that plays joyful, up tempo music that is often at odds with the more sombre fare of their respective solo careers. Most of the songs performed were familiar traditional songs such as Polly On The Shore and The Wife Of Ushers Well. One song that stood out for me was the Victorian broadside ballad, The Red Barn Murder, which tells the story of the murder of Maria Martin by William Corder at Polstead in Suffolk. Having grown up in the county, I must admit it was a song I had not encountered before. From the Village Pump stage it was off to the White Horse stage with our son whilst my partner and our daughter took part in the drama workshop. Where Gethin and I managed to catch two acts. Next on were Megson, husband and wife duo Stu and Debbie Hanna. The couple are now Cambridge residents but originally hail from Teeside. They retain a pride in their heritage, something that comes across in their songs, including that all too rare beast a folk song about Football. The Longshot is sung from the point of view of a long suffering Middlesbrough fan but whose words will strike a chord with anyone who has ever been a supporter of any sports team. Saturday's main event had to be the evening concert on the main Village Pump stage. First up were a band we first saw a couple of years ago at Bedwas Workmen's Hall near Caerphilly. That night Roving Crows played a great set in front a sparse crowd, even so I have been a fan ever since that night & it was good to see them perform in front of a much larger, and more appreciative, audience. For most people though, the highlight of the evening had to be Show Of Hands. Steve, Phil and Miranda's performance was being recorded for a live CD that will only be available to those people who signed up and pre ordered a copy on the day. Given the fact that the show was being recorded it was no surprise that the set was largely a greatest hits one. Right from the start with the opener Longdogs it was obvious that both band and audience were up for a good time and we were going to be in for a special night. 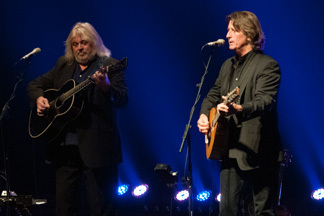 An emotional rendition of Cousin Jack, Country Life, Roots, Arrogance, Ignorance And Greed, all the Show Of Hands greats were there, one pleasant surprise though, was the inclusion of Innocents Song. The question had been asked on social media as to what songs people would like to hear and that had been my suggestion. That night must go down as one of, if not the, greatest Show Of Hands performances and it was a pleasure and an honour to be part of the audience. The one downside with the Show Of Hands set was that they were on relatively early and, after the energy of their set I felt some sympathy with any band having to follow that performance. Fortunately the next band on proved more than up to the task. Edward II are a band that I first encountered in 1990 when they supported Oysterband and June Tabor on their Freedom And Rain tour, although then their name was suffixed with "And The Red Hot Polkas". 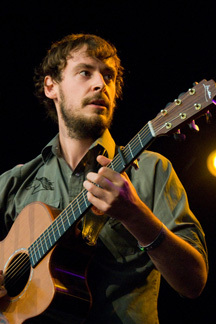 I have always enjoyed the band's fusion of traditional English Folk with Reggae and World Rhythms. Their latest project, Manchester's Improving Daily sees the band concentrating on the Victorian Broadside ballads from their home town. Edwards II's set was made up entirely of songs with a Manchester connection, from songs of protest from the Industrial Revolution through to a cover of New Order's Love Vigilantes and Ewan MacColl's class is Dirty Old Town (even if that is stretching the boundaries a bit by being about Salford. The band's arrangements have melded the rhythms and words together extremely well to produce a sound that steeped in the tradition whilst simultaneously defying you not to get up and dance. And so to the final band of the night, Treacherous Orchestra are a Scottish band cast from the same mould as the likes of Shooglenifty and Peatbog Faeries. Owing to two worn out children only caught the beginning of their set, but from what we saw they did what they came to the festival to do, namely, get the audience up and dancing. Safe to say, based on what I saw that night I fully intend to catch the whole of their set the next time I get the chance.